Fresh off the case of a deranged student who murdered his landlady, noted police investigator Porfiry Petrovich barely takes a breath before a bizarre and very grisly double murder lands him back on the streets of the tsarist St. Petersburg he knows all too well. The sardonic sleuth follows a trail from the drinking dens of the Haymarket district to an altogether more genteel stratum of society—a hunt that leads him to a conclusion even he will find shocking. 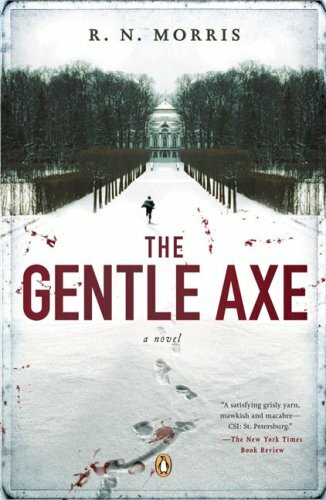 In the tradition of such first-rate historical novels such as The Alienist and The Dante Club, The Gentle Axe is atmospheric and tense storytelling from its dramatic opening to its stunning climax. Born in Manchester in 1960, R. N. Morris now lives in North London with his wife and two young children. He sold his first short story to a teenage girls’ magazine while still a student at Cambridge University, where he read classics. Making his living as a freelance copywriter, he has continued to write, and occasionally publish, fiction. One of his stories, “The Devil’s Drum,” was turned into a one-act opera, which was performed at the Purcell Room in London. Why has R. N. Morris chosen The Gentle Axe for his title? In what sense is he using “gentle” here? Early in the novel, the prokuror Liputin tries to discourage Porfiry Petrovich from pursuing his investigation of the deaths of Borya and Goryanchikov by pointing out the “self-evident inferior rank of the individuals concerned” (p. 43). In what way is class important in The Gentle Axe? Which characters are motivated by class distinctions? How does Porfiry feel about judgments based on rank? Porfiry Petrovich says that he does not believe “these mysteries are solved rationally, through the exercise of a cold, deductive reasoning” (p. 201). How does he solve the murders in The Gentle Axe? What unusual qualities of mind enable him to uncover the truth? What is he able to see that others do not see? In what ways does The Gentle Axe reflect the changes occurring in Russia during the latter half of the nineteenth century? What role does religious faith—or lack of it—play in the novel? What role does rationalism play in the novel? Salytov warns Porfiry that his methods may “one day backfire” on him (p. 270). What are Porfiry’s methods? In what ways do they serve him? In what ways does he use them to manipulate others? Do they backfire on him? Porfiry tells Virginisky, “Ah, the truth! If ever you do become a lawyer, Pavel Pavelovich, you will quickly learn not to rely overmuch on the truth” (p. 142). What does he mean by this? In what ways does “truth” prove unreliable in the novel? How surprised were you to discover who had committed the crimes in The Gentle Axe? What clues point to the perpetrator? Why would he have felt so confident that he could get away with his crimes? Father Amvrosy asks Ulitin, “If you don’t believe in God, what does it matter?” (p. 259). Why does it matter so much to Porfiry to solve the murders of two such “unimportant” figures? What is it that drives him to continue when all others are ready to accept the simple solution and close the case? Does a familiarity with Dostoevsky’s Crime and Punishment enhance your appreciation of The Gentle Axe? In what ways does Morris’s novel develop not only the character of Porfiry Petrovich from Crime and Punishment novel but also some of the themes that concerned Dostoevsky? How does R. N. Morris build and sustain the narrative tension throughout The Gentle Axe? What techniques does he use to create suspense? In what ways does the Russia of 1866 parallel our own time? Do the characters and events in the novel have contemporary equivalents?